World Championship Boxing is not for the faint hearted. The best fighters in the world face off to show their best abilities. On September 24, we are going to witness the fight between Anthony Crolla and Jorge Linares. Don’t forget to place your bets and stay tuned to see who’s going to win. With almost a week left up until the fight, let’s see who these people are. Crolla is risking his WBC belt for the second time in roughly one year. In November 2015, he faced Darleys Perez and won the title with a knockout. Half year later, in May, 2016, Crolla went up against the Venezuelan fighter Ismael Barroso. He came out victorious after a knockout on his opponent. Now, he is getting ready to fight another Venezuelan who wants the title just as bad: Jorge Linares. This man is a three-division world champion. In December 2014, he beat Javier “El Implacable” Pietro with a knockout in the 4th round. In London, he defended the title against Kevin “Mighty” Mitchel in May 2015 and stopped him in the 10th round. In October last year, Linares fought with a fellow Venezuelan: Ivan “Macanon” Cano. He knocked him out after 4 rounds. 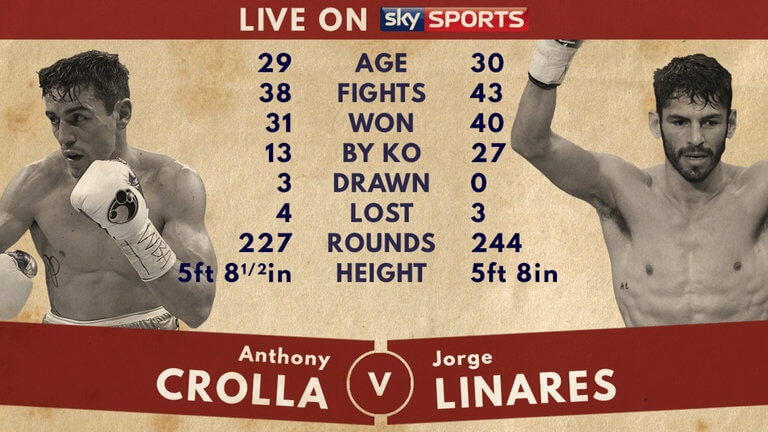 Both Crolla and Linares are very capable, but who is going to win this time? Crolla himself says that Linares is “a fantastic fighter and it’s another mountain to climb.” He then continues to explain that such obstacles are tests that make him a better fighter. Given his results against Perez and Barroso, Crolla is confident he can beat Jorge as well.